Sugar, Oil and Salt free diet! As a vegan, some people think all you eat is a salad. While that’s not true, you do enjoy getting your greens in a bowl. Salads are customizable, delicious, healthy, and make a great quick meal or side dish. There’s just one problem. Even though you’re meticulous in the foods you put in your salad, that dressing you love so much might not be SOS-free. Oils are often used to give salad dressing their smoothness and viscosity. Processed salts provide savory flavor. Even those fruit-based vinaigrettes that add a touch of sweetness may be bogged down with more sugar than you thought. If you’ve recently begun an SOS-free diet, you’re probably used to making a lot of your food at home anyway. Why should salad dressing be any different? Recreating your favorite salad dressings yourself may seem challenging, but it’s easier than you’d believe. In fact, you’ll find it especially simple by following along with these 10 delicious, nutritious SOS-free salad dressing recipes. We’ve shared many a recipe from Chef AJ on this blog, frankly because they’re all so yummy! Few are yummier though than her appropriately-named Yummy Sauce. This has been a staple in many of her dishes, and fans have been clamoring for years wondering what the secret is to the Yummy Sauce. Now it’s finally been revealed! Use any blender that’s high-powered. Chef AJ prefers a Vitamix. Dump the above ingredients in the blender. Run the blender for under a minute. The ingredients should now have a soft consistency. You’re done! Use on salads, rice, steamed vegetables, and anything else you please. Mmm, few salads are more filling and fulfilling than the classic Caesar. The creamy, tangy dressing that tops this salad of greens, croutons, and faux cheese can be modified to be SOS-free. Just follow this recipe from Dr. John A. McDougall. Mix the nutritional yeast, salt-free Dijon mustard, garlic, and almond meal in one mid-sized bowl. Stir until they become paste-like. Add the other ingredients to the bowl, incorporating fully. Pour the ingredients into a jar. Put a lid on the jar and get ready for the fun part. Now we get to shake things up, literally! This will fully distribute the ingredients. You may remember High Carb Hannah from our article about the dangers of salt. Now she’s back with a salad dressing recipe you’ll fall in love with. Per her video, we’re recreating her recipe for Smoky Maple Mustard Dressing. If you like the tanginess of mustard and the grilled flavor of food from the barbeque, this will become your new go-to dressing! In a small bowl, mix your sugar-free maple syrup, salt-free mustard, and the Worcestershire sauce and stir using a whisk. The ingredients should be well incorporated. Add the liquid smoke or salt-free, sugar-free barbeque sauce, stirring as you do so. That’s it! Serve on a hearty Tex-Mex salad or anything that strikes your fancy. 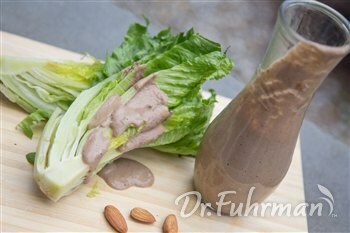 This semi-sweet, semi-savory Almond Balsamic Vinaigrette from Dr. Joel Fuhrman will dress up even plain salads. If you’re tired of munching on greens, you’ll enjoy doing it all over again with the rich, distinct flavors of this recipe. Turn on your oven, letting it preheat until it reaches 350 degrees Fahrenheit. Unpeel the garlic cloves but keep the skins on. Put the cloves on a baking dish. Let them cook in the oven. After they turn soft (which takes about 25 minutes), take them out. Let the garlic cloves cool down. Then take the skins off. Pour your remaining ingredients in a blender or food processor. Mix in the garlic and combine until the ingredients have a dressing-like consistency. If you like to mix fruits with your veggies, this recipe from Happy Healthy Vegan’s Anji will certainly satisfy. Her SOS-free Citrus Date Dressing goes best on a summer salad with yellow tomatoes, celery, and butter lettuce. Of course, you can—and will—use it on just about anything. Who can blame you? It’s downright addictive! Start by squeezing the citrus fruits. Make sure you remove any pulp and seeds. Add the juice into your favorite blender. You should have about a cup and a half. Pour in the water and the dates. The water can make the consistency more liquid-like. Blend until the ingredients are ready. MaggiesVeganEats presents this fun recipe, which she makes in several ways. Yes, that’s right, Vegan Tahini Salad Dressing not one, not two, but three ways! That’s part of what’s so amazing about salad dressing recipes: their versatility. You can add ingredients, omit some you don’t like, and change it up anyway. Pour your tahini in a small bowl. Squeeze a lemon, getting the juice in the bowl. Be careful not to get any seeds or pulp, though! Take them out if you do. Add your sugar-free maple syrup, stirring until all the ingredients are well incorporated. Water makes the salad dressing more liquid-like. Add a single tablespoon, stir, and then pour more water in as needed. Again, pour tahini into a small bowl. Add your balsamic vinegar and sugar-free sweetener. Scoop in the salt-free Dijon mustard and stir. Just like with the first recipe, pour in water a tablespoon at a time until the dressing is less thick. Yet again, pour your tahini in a small bowl. Squeeze all the juice you can get from half of a lemon into the bowl. Remember, no seeds! Add your salt-free soy sauce and apple cider vinegar as well as your sugar-free, dairy-free almond milk. Next, pour in your greens, including the dried dill, dried parsley, dried oregano, and green onion. Stir. A touch of almond milk, not water this time, can get you the right consistency. This colorful, tangy recipe from Kristen at Hello Nutritarian for No-Oil Spinach Pesto Dressing stars Dr. Furhman’s Mediterranean Stone pine nuts. According to Kristen, these nuts can boost satiety due to their polyunsaturated fat content. They’re also full of manganese, non-heme iron, zinc, phosphorous, Vitamin E, and Vitamin K. That’s a winner in our book! Gather the above ingredients and put them in a blender. Mix the ingredients until they reach a salad dressing consistency. Use on salads immediately. What you don’t use can go into a Mason jar and be good for about 10 days. 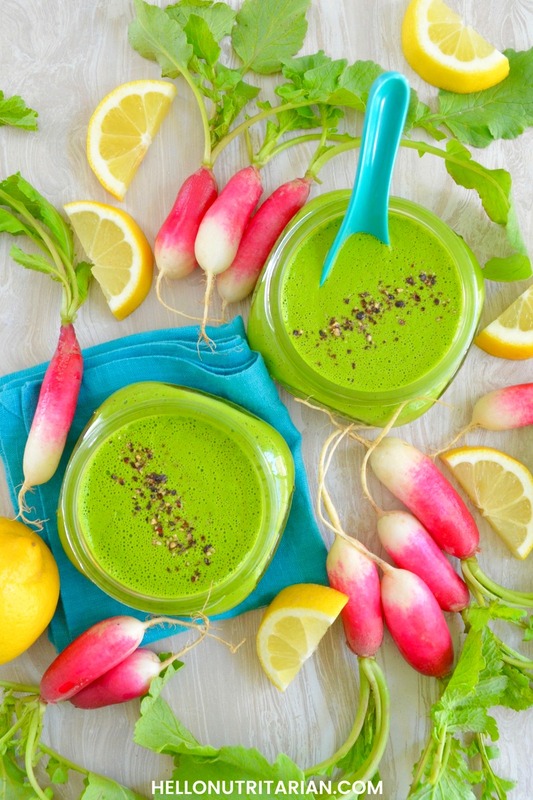 Rene atThis Savory Vegan shares this bright, cheery, and green Creamy Avocado Fresh Herb Dressing recipe. It just screams spring. Any lunch or dinner salad lucky enough to get this dressing will become your favorite meal of the day. Prep your food processor and dump the above ingredients in. Turn the food processor on its highest setting. The ingredients should be silky and soft. Try the salad dressing. If it needs more spice, add it. Here’s yet another five-star recipe from Hello Nutritarian. Kristen says this recipe is how she managed to enjoy two main course salads daily without getting sick of them. All you have to do is take a look at this recipe to understand why. It’s got everything you could ever need: hummus, a rainbow of vegetables, and a delicious dressing to boot. Follow Kristen’s recipe for SOS-free hummus here or buy your own from a vegan grocery store. Make sure it doesn’t have any salt, sugar, or oil! Rinse your lettuce head and cut it up. Transfer it to a big bowl. Add your green onions, red cabbage, carrots, and bell peppers, organizing these in a visually appealing way. Scoop your hummus in the center. Top the whole thing with the balsamic vinegar dressing. Dreena Burton’s Mango Hemp Dressing is one of the sweeter picks on this list. Real mango pieces make it feel more like a fruit salad, but flavors such as salt-free Dijon mustard, shallots, and hemp seeds balance it out. Mix the sugar-free maple syrup with the ¼ cup of water. Then add the other ingredients in a blender. You can use more water to get the consistency liquid-like if you have to. Sugar-free maple syrup can add a sweeter flavor to this salad dressing. You can use green onion whites (one tablespoon) in lieu of the shallots if you want. You can even replace the lime juice with two tablespoons of red wine vinegar. Pour on a salad and serve. With an endless combination of fruits, veggies, raw nuts, and countless other toppings, you can eat salads forever. If you’re getting a little bored, though, we recommend you try any of the 10 SOS-free salad dressing recipes we highlighted above. They’ll add some zip to your salads and some pep to your step! Previous PostPrevious Why Is Oil Bad for You? Is It Dangerous to Stop Eating Salt? Why Is Oil Bad for You?